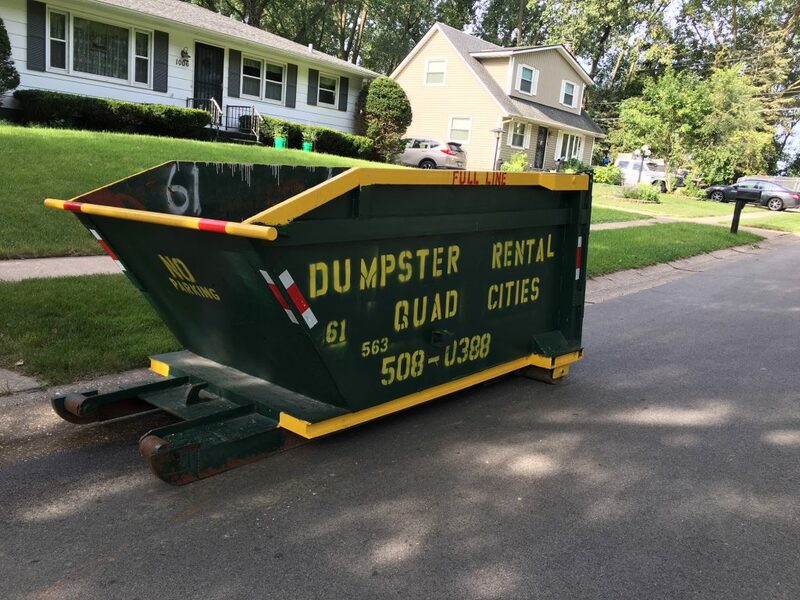 Folks Are Always Asking, How Much Is Dumpster Rental In The Quad Cities? Well dumpster rental in the Quad Cities is a competitive business with many waste management firms who compete for your business. Some roll off dumpster companies specialize in temporary dumpster rental services in Moline Illinois, Davenport Iowa and the rest of the Quad Cities area. While other waste management companies provide several other services such as front load commercial garbage collection. This containerized collection is often provided on a scheduled basis with dumpsters being emptied on site on pre determined days each week. Other services provided by local waste haulers include residential curb side garbage collection, which may or may not be automated with 90 gallon refuse carts. So the point is some waste service providers do only roll off dumpsters while others provide a variety of services. Dumpster size is always a variable in pricing as big dumpsters tend to cost more to service/haul than smaller roll off bins. A 30 cubic yard dumpster might necessitate a tandem axle roll off truck for transportation to your location and to the landfill whereas a 10 cubic yard roll off might be services by a smaller single axle vehicle. So assuming a big truck costs more to operate than a smaller one, and i think that’s a safe assumption, the cost of renting bigger dumpsters would logically be more. The type of debris you eventually toss into your dumpster also effects the cost of the waste hauler to provide you dumpster rental service. Suppose you put brick and dirt into your rented roll off container in Geneseo, Illinois and the landfill charges based on tonnage, which they do. Well the cost of dumping that load at the local sanitary landfill could actually be great than the cost of disposing of 20 cubic yards of household junk. So most haulers charge a bit more for the heavy loads in an effort to cover all their costs. After all, landfill disposal costs can be significant for waste haulers in the Quad Cities area. The time you keep your roll off box might effect your total cost of renting your dumpster in Rock Island, Illinois. Dumpsters cost the waste haulers in the Quad Cities area thousands of dollars a piece and then there’s the cost to paint them, weld them, store them, etc. So many local waste companies include a week or so worth of rental charges in the initial haul rate, but then charge a daily rental fee after a set period of time. The excess daily rental charges can be avoided or at least reduced by planning your project to minimize the days your rented equipment is kept on site. And by all means, don’t forget to call your waste company and inform them when you’re finished wth your bin-They can not read your mind, so unless plans to remove equipment have already been pre determined and conveyed to you hauler, you’ll definitely need to contact them to schedule removal of equipment. I’d be kidding myself and doing you an injustice if I were to leave out this one- Haulers, like most other businesses, charge differently when compared to one another. Some waste haulers have lower cost structures than others, some provide service superior service, some have newer more reliable trucks and dumpsters, some pay drivers a living wage while others hire fools who drive dangerously. All of this effects the prices they ultimately charge to you, the waste generator. So it’s up to you to find your own balance between value and price, reliability and savings. You’ll need to investigate and determine which contractors increase your level of frustration with their out-of-town call centers and bureaucracy vs reliable companies who deliver well maintained dumpsters on time using safe drivers, etc. And i’d suggest that you actually make your own decisions based on your own common sense or discussions with your friends and neighbors rather than relying on Angie’s List, Home Advisor, Better Business Bureau, Yelp, etc as all of these entities, many who claim to investigate and find the perfect contractor, are really of little use. So ask around locally and don’t believe half of what you read on the internet, and you might just find a dumpster rental company in the Quad Cities that you can count on. So for exact prices and details on you next project, contact us and we’ll give you the rundown on our dumpster sizes, dimensions, prices, etc. We deliver roll off dumpsters to the entire Quad Cities including Moline, Davenport, Bettendorf, Rock Island, Milan, Reynolds, Geneseo, DeWitt, Clinton, Muscatine, etc.